Ashland was founded at the crossing of two great trails, the Camp Supply-Fort Dodge and the Sun City-Meade trails. In 1884 the Ashland Town Company of Winfield organized to establish a county seat town in western Kansas. The town, which was named for one of the founder's hometown of Ashland, Kentucky, quickly grew and prospered. Clark County, organized in 1885, chose Ashland as the county seat. The rich heritage comes alive when visitors view the historical sites in the Ashland area. Mt. Jesus, located one mile east and seven miles north of Ashland was named in 1868 by General George A. Custer's Quartermaster, H.C. Inman, when they camped near the base of the hill as the troops moved from Camp Supply before the Battle of the Washita. Monte Casino is located on a hill about three miles north of Ashland on the State Lake Road. A marker is on the site of a monastery established by three Benedictine Brothers who came to Clark County in 1876. St. Jacob's Well is found 13 miles west of Ashland in the Little Basin, east of the Big Basin, a sinkhole created by underground erosion. St. Jacob's Well, which legend says has no bottom, never goes dry, and was a watering place for cattle being driven on the long cattle drives to Dodge City, is marked by a stone on the highest point. 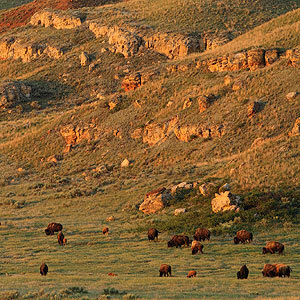 Today, a herd of buffalo can be seen grazing on the short prairie grass of the Big Basin Preserve. The Hardesty House is a hotel with restaurant and club featuring historical motif. It is listed as one of the 10 best places to eat in Kansas. It is closed on Mondays. Big Basin is a large circular depression. It is about one mile in diameter and about 100 feet deep. The walls of the basin are nearly vertical. Scattered across the floor of Big Basin are a number of small ephemeral ponds that catch and temporarily hold the water that flows into the basin. Red Dirt Country B.B.Q. Cook-off ! !